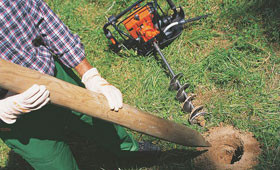 The potential uses for STIHL drills are considerable, from drilling planting holes to taking soil samples. The STIHL BT 130 one-man auger is equipped with a QuickStop drill brake for additional safety. The brake is triggered by the operator's thigh as soon as the drill jams in the ground, bringing it to an immediate standstill. Hip padding is also included as standard. The innovative hand held drill BT 45 can be used to drill wood as well as planting holes, depending on the equipment used.